The entire community is invited most Wednesdays (September-May), 5-6 p.m., for a tasty meal and great fellowship in Reformation Hall. Lunch is served during Lent from 12 to 1 p.m. Meals and fellowship provide an opportunity for our congregation to gather together both around God’s Word and in community to share in faith with our neighbors. ● 3- and 4-year-olds, 6:30-7:15 p.m.
● Kindergarten-5th grade, 6:30-7:30 p.m.
Scripture First is a mid-week experience for kids to connect with peers and to learn about God’s love. Class content is not duplicated from Sunday’s Scripture First lesson. Please use the above button to register your child(ren). Join us in the main sanctuary at 6:30. Parents are invited to stay and help with Scripture First classes; more shepherds are always welcome! For more information, please contact Heather Smith, Children's Minister. For the safety of our preschool and elementary children, parents should park their vehicles and walk in with their children to check them in to Scripture First and receive a security badge. 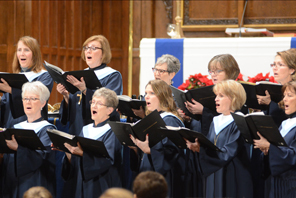 Please note: Carol Choir for children in first through fourth grades meets Saturdays, 10:15 a.m. to 12 p.m. No registration required; come join us! No musical experience is necessary; please join us! For more information, please contact Shirley Barlow. Sixth- through ninth-grade youth attend confirmation on Wednesday nights throughout the school year. This time gives the youth a chance to learn about what it means to be a Lutheran and to dig deeper into their faith with the Bible, group discussions, and worship. For more information, please contact Marnie Dahle Backer. 6th-8th grades, Wednesdays, 6:30-7:30 p.m.
Meet in the Sanctuary for opening worship. Sit with your small groups, and please bring your binders and Bibles! 9th-12th grades, Wednesdays, 7:30-9 p.m.
Meet in Manos de Cristo for an hour and a half packed with faith formation, fellowship, games, worship, snacks, and anything else we can squeeze into our time together! Come, and bring a friend. No auditions required. This adult mixed ensemble is open to anyone who would like to sing, college age and up. 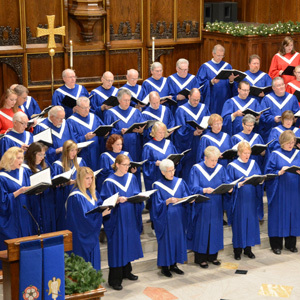 This group is a full, mixed choir consisting of soprano, alto, tenor, and bass parts, who sing a wide variety of music. Women college-age and up are invited to sing with this ensemble. This choir sings a wide variety of music. *Please note: Times are slightly different during Lent. Click here to view the church calendar. For more information about the choirs, please contact Shirley Barlow.